The Clear Blue Controller and cloud management platform includes customizable alarm and alert notifications for your installation. This can be used to send notification alerts to different team members when an event occurs. Large installations (parking lots, etc.) might have lower level alerts sent to facilities management and higher level alerts (energy generation, etc.) might only be sent to marketing personnel. 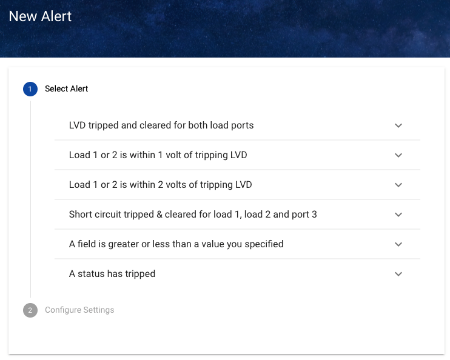 The system is designed so that different types of alerts and notification thresholds can be designed on a per device (pole) and port (solar panel, wind turbine, camera, etc.) level. Illumience Cloud Control sends notifications automatically to different recipients using whatever wireless network it is configured to use. Notifications can be sent via email or SMS text, and contain the necessary links to allow users to drill down to deeper levels of data if they desire. Many of these alarms are automatically sent to Clear Blue's network management centre, where technicians can provide additional insight, or potentially resolve the issue before a ticket has been generated to customers.